Here’s another free tool any Windows power user should have: WinCDEmu. It allows you to mount to any drive letter an image file. It supports: ISO, CUE, NRG, MDS/MDF, CCD, IMG images. Tired of swapping in and out your CDs or DVDs? Tired of lending your movies and getting ’em back scratched? Don’t wanna spend money on dual layer DVDs? There’s so many reason to use it! Don’t want to install a software? Good news! There’s even a portable version! No Japanese characters in Firefox? Solved! I just solved this very problem minutes ago. I couldn’t see Japanese characters in my browsers, now I can. This how-to is aimed at Windows XP Pro users (yes, we rock). Sure, a quick Google will give you answers, but you might not find much about the problem I encountered: that is missing files or actually, files with messed up extensions within the install disc. – To view Japanese (or any East Asian languages as it’s called) it is your OS that supplies these libraries to your browser, not the other way around. I was missing them, so I needed to install those from the Windows XP install Disc. 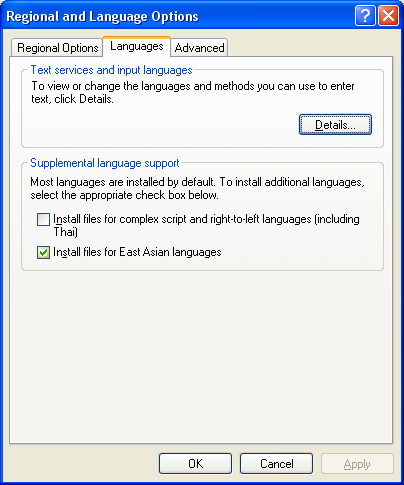 – Insert you XP Pro CD, then go in your Control Panel -> Regional and Language Options -> Click on the Languages TAB and at the bottom, check the check box that says:  Install files for East Asian languages. You’ll probably be shown a message saying it can’t find a file (it will prompt for each missing file, thus telling you which one to look for!). – Don’t worry, your files are not missing from the disc. It’s the file extensions that are messed up. Probably Microsoft did that to prevent at large distributions of the DLLs. Anyway. My trick was to copy all the folders from the CD onto my hard drive, in a temporary folder, then use a small program to rename properly all the extensions. It requires just a few minutes and a few mouse clicks. 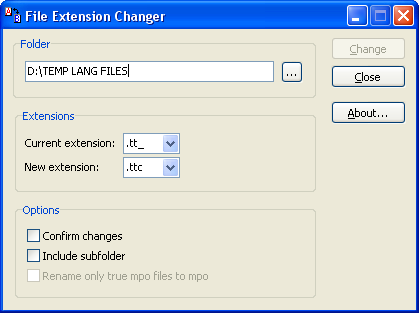 – I used the freeware File Extension Changer 1.1 application from 3dtv.at. When you’re prompt that ABCXYZ.dll file is missing, rename all the “.dl_ to .dll”. Missing a “.htp” files? Rename all “.ht_” extensions to “.htp”, and so on. Click retry and wait for the next “missing file”. Rename, repeat, rinse, etc. -You won’t need to rename every single extensions, some will still have an underscore ( _ ). As long as you renamed all the one that were requested (missing) you’ll be good to go. – When you’re done, Windows will prompt you to restart. Do so, then launch your favourite browser (Firefox of course), visit that website you were dying to see the Japanese characters and Voilà!